Your family will love the great ocean and beach views from your private oceanfront balcony in this spacious Ocean Bay Club condominium.Enjoy the Ocean Drive Difference by starting your vacation immediately upon arrival, as this property comes with fresh bed linens/bath towels, the beds are already made up for you, and the departure maid service are all included in your price. 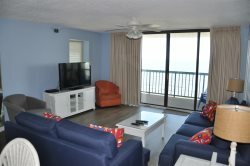 Located in the heart of North Myrtle Beach, along Ocean Drive, Ocean Bay Club 1401 is in the perfect location!. Each bedroom has an ocean view, and one bedroom has its own private balcony. Amenities include 5 TVs, DVD players and WiFi internet access. You'll be able to watch friends and family play on the beach from the large oceanfront balcony, accessible from the living room. Children and adults alike will love the pools, hot tubs, and lazy river at this resort! Ocean Bay Club is in close proximity to popular North Myrtle Beach attractions, shopping, and restaurants. Ocean Drive's famous shag clubs are just a short walk away from the resort. Guests have access to refreshing pools, hot tubs, and a kiddie pool. Ocean Bay Club 1401 has recently undergone a complete renovation. Soothing beach colors and upgraded furnishings perfectly compliment the beautiful ocean views.